The Galápagos Islands are famed for their vast number of endemic species and the studies by Charles Darwin that led to his theory of evolution by natural selection. It is an archipelago made up of 13 main volcanic islands, 6 smaller islands, and 107 rocks and islets. The oldest island is thought to have formed between 5 and 10 million years ago, a result of tectonic activity. The youngest islands, Isabela and Fernandina, are still being formed, with the most recent volcanic eruption in 2005. The islands are distributed around the equator, 965 kilometres (about 600 miles) west of Ecuador. The Galapagos Islands don’t need a long introduction: they were among the first batch of inscriptions in 1978 (actually it was the very first on record) and they were also a shoo-in at our Top 200 WHS. One can ‘do’ the Galapagos either via an accommodated cruise or a self-arranged land-based alternative, which has become more feasible and popular in the last 10 years. For me the choice was clear quickly: to be ‘locked up’ on a rather small cruise ship for at least a week with strangers did not seem appealing to me at all. Also I am not a fan of daily water based activities like snorkelling and swimming. So I based myself in the town of Puerto Ayora on Santa Cruz island, the largest town on the Galapagos Islands. Puerto Ayora nowadays is a surprisingly touristy and affluent city. It isn’t unlike a Greek harbour town, with tourists milling around in the streets at all hours and daily departures of ferries to other islands. I had planned on taking two organized day tours from here: to North Seymour and Bartolomé. But unfortunately the latter got cancelled because of too few bookings. Instead of Bartolomé I eventually choose Isabela island. I spent the rest of my time on Santa Cruz itself. Santa Cruz is far from pristine, but a good spot nonetheless to see certain species – in particular the giant tortoise. Probably the first stop for every tourist on Santa Cruz is the Charles Darwin Research Station. It is located a pleasant walk away from the Puerto Ayora town center, and you’ll see mangroves, birds and the tortoise breeding center. The best place to see giant tortoises in the wild is in the highlands of Santa Cruz – you can already see them in the fields along the road between the ferry to Baltra Airport and Puerto Ayora. I went to look at them more closely in El Chato reserve, but on the way up there we already encountered one in the middle of the road amidst the fairly busy traffic of taxis, buses and trucks. The tortoises at the reserve go about eating their grass quietly, they’re wonderful to watch. They’re not particularly bothered by human visitors though they sometimes stop eating and look up. Also I found one or two hissing, a sign of fear or annoyance? My first full daytrip went to North Seymour, an uninhabited island about 45 minutes away from the canal between Santa Cruz and Baltra. It's a small and flat lava island, known for nesting birds. 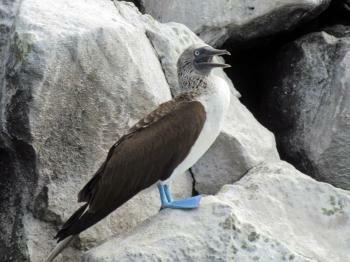 Especially the blue-footed booby and frigatebird can be seen in large quantities doing their thing. There’s a 2km trail on the island which we slowly hiked accompanied by a guide. We saw many young chicks of both species, often on nests right beside the path. Of course everyone who visits the Galapagos wants a good picture of a blue-footed booby, and you must be a real bad photographer not to succeed. Especially this species is without any fear of humans and often hops closer to get a better look at the passing tourists. Their fluffy offspring, already quite big actually, did take my heart though. My other daytrip, to Isabela, first involved a public ‘ferry’ ride of 2 hours (the ferries here are small speedboats that take only some 20 passengers). It’s a very bumpy trip but fortunately I had some seasickness tablets left from my trip earlier this year to the Azores. Isabela is the largest island of the archipelago, but I only had time to check out the area not too far from its port. 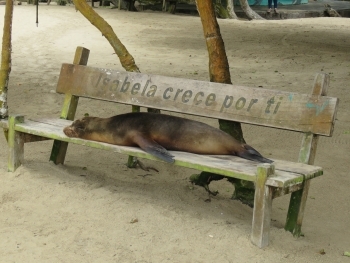 Sleeping sea lions, occupying the wooden benches that must have been meant for waiting tourists, are a common sight here. I did a short hike on the island near two lagoons with flamingos, and returning to the port via a long stretch of beach home to hundreds of marine iguanas and lava lizards. Beforehand I had bought the Bradt Galapagos Wildlife guide, and then I was already surprised that all of Galapagos’ flora and fauna fit into a 156 page booklet. Anyone who has seen for example the volume and density of a bird guiding book of let’s say Costa Rica will notice that the diversity of species at the Galapagos Islands is very low. During my short stay I saw almost all species of interest named in the book, many of them in large numbers and at multiple locations. Unfortunate misses included the green sea turtle (was seen by people snorkelling during my day trip to North Seymour), the penguins (due to the cancelled day trip to Bartolomé and me not making a real effort for it at Isabela) and the Galapagos hawk. Actually, despite its fame, these islands are infrequently visited due the remoteness of the islands and limited permits from the government that are available (and the prohibitive cost, something that was a problem for us for a long time). But for this who do visit here, they will be immensely rewarded. It is in these remote islands that animal evolution took a turn to...the weird. You’ve got so many unusual Galápagos Islands animals: flightless cormorant birds, warm weather penguins, lizards that swim, and many other unusual animals. These unusual animals inspired naturalist Charles Darwin’s study and eventual theory of evolution by natural selection. This important scientific discovery fundamentally changed the way we view our natural world. Each of the Galápagos Islands is different with their own unique flora and fauna. From volcanic and barren Fernandina in the west to lush and tropical San Cristobal in the east, there is a tremendous diversity to explore. Each island is just a little different, and completely special and unique. Visiting the Galápagos while in Ecuador is a once-in-a-lifetime experience and we’d highly recommend it to follow travelers. The Galápagos Islands are a nature-lovers dream, home to giant tortoises, iguanas, sea lions, penguins, flamingos, pelicans, Darwin's famed finches, frigates, and, my favorite, the blue-footed booby. And that's just on land. Rest assured, if you are hoping to see wildlife, you will not be disappointed with the species endemic to these volcanic isles on the Equator. 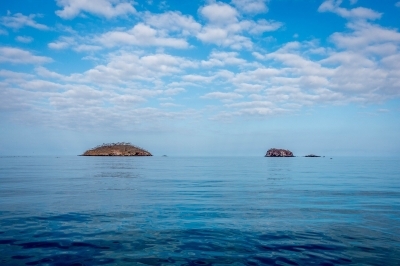 When planning a trip to the Galápagos, you have the choice of joining a multi-day boat tour of the islands or creating your own tour by flying or taking ferries between islands. I chose the latter when I visited the Galápagos in June. If creating your own tour, you also have to decide which islands you'll visit. I chose Santa Cruz Island, in the center of the archipelago, and Isabela Island, the largest of the islands. Santa Cruz Island is home to the Charles Darwin Research Station, on the east side of the main town of Puerto Ayora. The station is worth a leisurely visit (bring water), and also holds the UNESCO plaque for the Galápagos, the first World Heritage Site. Puerto Ayora is a great place to schedule day trips, with many options to visit other islands. Since the islands are a national park, you will always have a trained guide with you on any tour. Puerto Ayora has ferries to other islands, which is how I traveled to Isabela Island (be prepared for occasional rough seas). Both Santa Cruz and Isabela Islands have giant tortoise research stations, which are worth visiting if for no other reason than to see incredibly cute baby tortoises. Isabela Island offers a snorkeling tour to Los Túneles, which I highly recommend for the opportunity to see reef sharks, sea turtles, manta rays, penguins, and unique lava rock formations. I would advise using a wetsuit (offered by tour companies), since the waters are chilly. I'd also advise not forgetting to bring contact lenses if you need them -- I have full confidence I was shown a sea horse, though it looked like a stick to me! The Galápagos Islands are an incredible site to visit, and not to be missed if traveling to Ecuador. Logistics: There are two airports serving the mainland in the Galápagos: one on Baltra Island, which requires a very short ferry to Santa Cruz Island, and one on San Cristóbal Island. Be prepared to pay the national park fee upon arrival to the Galápagos. There are inter-island flights between Baltra, San Cristóbal, and Isabela Islands, but they have baggage weight restrictions. There are also ferries connecting Santa Cruz, San Cristóbal, and Isabela Islands. We traveled to the Galapagos Islands in early September. We spent time in Quito,Ecuador on both ends of the trip. We spent 8 days in the Galapagos on a 16 passenger cozy boat. the crew were great and they only roughness we experienced was during the night travel when the boat rocked and rolled due to the Humboldt current and our speed. When you visit the islands your itinerary isn't set definitely until you sail. The govt monitors the numbers on the islands by day. We left from San Cristobal and traveled to several different islands. I was initially worried that we would not find any animals but I was amazed at their numbers and that they didn't scatter when we arrived! The birds, sea lions, penguins etc were all amazing. We had a naturalist with us and he had tons of info to share. The trip was well managed and we spent a morning in one location, had lunch and a rest period and then went out again until dinner time. The climate was warm and sunny each day but the water was extremely cold due to the current. When we went, many of the birds had their babies and that was pretty amazing. No matter when you go to the Galapagos, you are guaranteed to see a lot of birds, iguanas, sea lions, tortoises,lizards, albatross, frigates, blue footed boobies, herons, warblers, finches etc...it is nature at its' best! The usual problem with taking “wild life” holidays is the uncertainty as to whether one will actually see the creatures one is traveling so far (and often paying so much!) to see. Over the years we have seen most of the animals we have gone to see – but it has sometimes taken several visits to do so – thus we have failed to see Gorillas in Gabon, Wolves in Alaska and Jaguars in Guyana. A great thing about the Galapagos is that the animals WILL turn up on cue. There may not be a vast variety of species but, if an island is supposed to have a species, you will have to be very unlucky not to see it!! And on top of that of course they are incredibly tame. Darwin wrote at one point in his diary - 'I pushed off a branch with the end of my gun, a large hawk'. It was wonderful to have this episode confirmed as we landed on an island and there in front of us was a Galapagos Hawk. As we approached closer and closer it did not attempt to move. We did not of course push it off its perch with a gun or anything else but there was no doubt that we could have if we had been so minded! 5.0: Solivagant Svein Heltberg Kelly Rogers Travel Addicts Tevity Anne AndreaTLV Michael anak Kenyalang Gary Arndt Randi Thomsen Peter A. Affected by El Niño: Crit ix: "the Marine Reserve, situated at the confluence of 3 major eastern Pacific currents and influenced by climatic phenomena such as El Niño, has had major evolutionary consequences and provides important clues about species evolution under changing conditions"
Reintroduced Species: 39 Espanola tortoises have been introduced to Pinta. They are regarded as being the closest genetic match to the Pinta tortoise - of which only "Lonesome George" remains. Whilst there remains a slight hope that George might father hybrid offspring with captive Espanola tortoises, those released are sterile. If they survive, and no hybrid emerges, it is the intention to release fertile creatures with the objective of re-engineering a full "ecosystem" of which a tortoise presence of some sort is an essential element. Lazarus species: Fernandina rice rat: thought extinct in 1996 (last seen 1980) but found again in the late 1990s. Santiago Galápagos mouse: thought extinct and last recorded in 1906, but was rediscovered in 1997. Recently Active Volcanoes: One of the world?s most active volcanic areas, with more than 50 eruptions in the past 200 years. Six of the volcanoes are still active (1 on Fernandina and 5 on Isabela). The most recent explosion was Cerro Azul on Isabela in September of 1998. Deepest: "The islands have been formed by volcanoes rising out of a submarine platform at a depth of 1,300m. In outer waters, ocean depths fall to 4,000m except for the existence of several seamounts which rise to less than 100m below sea level." AB (Exact location of site boundary not clear! The park includes "all waters within 15 nautical miles of a baseline joining the outermost points of the Galapagos Islands"). Christopher Columbus: Their official Ecuadorian name is "Archipiélago de Colón" or "Islas de Colón". However, Columbus never went there. Foreigner prices: 100 USD for foreign tourists, 50 USD for Andean Community and Mercosur nations and 6 USD for Ecuador nationals.